In 2010, the Nationalities Services Center worked with Pennsylvania Horticultural Society (PHS), and Philadelphia Department of Parks & Recreation to establish the Growing Home Garden in South Philadelphia. The garden was originally created to improve refugee diets by providing nutritious produce indigenous to their ethnic backgrounds. The project grew beyond its original intent of meeting the nutritional needs into creating a safe community space for newcomers to begin to put down roots and make Philadelphia their new home. Today, the Growing Home Garden has become much more than a garden. It is a therapeutic outdoor space for over 100 Burmese and Bhutanese refugees to build community and reconnect to their agricultural roots. The garden offers a safe space for newcomers who have experienced tremendous stress and trauma to engage in healthy and enjoyable activities. It has also become a place that allows for inter-generational learning as elders teach their grandchildren how to grow food. PHS worked with the gardeners to track down seeds for over 67 varieties of vegetables and herbs including mustard greens, Thai basil, chili peppers, eggplant, and bitter melon. This work has allowed many families to extend their food budgets by growing produce essential to their native cuisine and difficult to purchase locally. In 2014, the Neighborhood Gardens Trust became involved with the Growing Home Garden to help permanently preserve the garden, after several properties had been lost due to new real estate development. The experience of losing access to land was tragically familiar and triggering for many of the gardeners. The significance of the Growing Home Garden and the threat that much of the land could be lost captured the interest of National Geographic, which published a feature on the garden in 2015, coinciding with Pope Francis’ visit to Philadelphia. 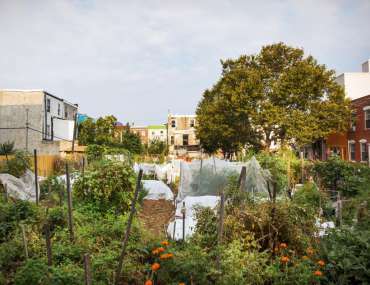 The Growing Home Gardens includes eight properties clustered on two blocks in South Philadelphia. Some of the land is owned by the Philadelphia Department of Parks & Recreation, which originally provided a lease to start the garden on the 700 block of Emily Street. NGT has focused on preserving additional properties which did not have secure land tenure that the gardeners are using to grow food. NGT has worked with Councilman Mark Squilla, the Philadelphia Land Bank, and the Redevelopment Authority on a land assembly strategy. NGT was making progress to execute this strategy when, to our dismay, in 2017 a property in the middle of the largest section of the garden was purchased by a developer who planned to build a single house that would divide the garden in half and block its sun exposure. NGT was able to convince the developer to delay construction and to accept an alternative property to prevent the garden from being split. In order to make this possible, NGT and the Philadelphia Land Bank developed a new legal process to allow for a land swap. United Communities of Southeast Philadelphia, one of the other landowners, agreed to donate its property to NGT for permanent preservation as well. Last January, this long and complex process came to fruition when NGT went to the settlement table to acquire the final property from the developer. This officially completed the permanent preservation of Growing Home Garden on Emily Street. NGT continues to work with the city and private property owners to secure sections of the Growing Home Gardens on the 500 block of Mercy Street. Coinciding with this land preservation milestone, this spring NGT is thrilled to welcome SEAMAAC as new partner on this project. As a nonprofit in South Philadelphia that works to support and serve immigrants and refugees and other politically, socially and economically marginalized communities as they seek to advance the condition of their lives in the United States, SEAMAAC will join NGT and PHS to support the Growing Home Garden with its rich history of immigrant and refugee gardeners making a home for themselves in our city.